You’re planning a trip to Thailand and/or Southeast Asia—congrats! It’s among my favorite parts of the world and one of the easiest places to have an incredible experience. Between the food, the people, and the sheer number of cultural, historic, and natural sites, you will not want for things to do. Most backpacking trips in the region start in Thailand—it has the most well-developed tourism infrastructure in Southeast Asia, and Bangkok is the main transit hub for international flights (you could fly into, say, Ho Chi Minh City, but the flights are generally cheaper into Bangkok’s BKK airport). Once you land, you need to understand how to get around Thailand—what is the transportation situation on the ground, and should you take a bus, train, plane, or boat to your next destination. I lived in Thailand for more than a year, and have backpacked extensively in Vietnam, Laos, Cambodia and Myanmar too, so matter where in Thailand you’re going, this guide to transportation in Thailand has you covered. Visit my free Thailand Travel Guide for food/sightseeing information, and my Chiang Mai guide (this is where I lived) for insider advice on what to eat, see, and do. If you’re backpacking Southeast Asia for the first time, I have 11,000+ words dedicated to everything you should know before you go! Most backpackers will arrive in Thailand via Bangkok’s Suvarnabhumi Airport, which is around 30km (19 miles) from the city centre. There are a few options for getting into the city centre: airport shuttle bus, taxi or the Airport Link train. If you’re staying near Khao San Road, the shuttle bus is your best (and cheapest) option, however, if you’re staying at a hostel or hotel near a BTS stop, the Airport Link train is best. If you’re arriving at crazy hours of the day or night, splurge on taxi transfer. As I noted, Thailand’s transportation infrastructure is well-developed. There is a network of trains (these are the slowest transport option, but often cheaper), an extensive network of long-distances buses that rocket out into every corner of the country, and several budget airlines making travel north toward Chiang Mai, or to the islands in the south, quick and relatively painless (and often quite cheap if you travel carry-on only, especially). Budget backpackers will love the low cost of traveling around Southeast Asia—it’s why this region is perennially popular. The range of planes, trains, and buses keep costs low, even when you’re going long distances. For those with a bit more cash in their pockets (like mid-range backpackers, digital nomads, retirees, and others), a small splurge can significantly increase your comfort on long travel days. I’ve traveled the region both ways over the past decade—bare-bones budget in my mid-20s, and on a mid-range/digital nomad budget in my early 30s. Budget backpackers almost always use the long-distance bus network and trains to criss-cross Thailand, but those with more cash can splurge on a discount airline ticket, or a first-class compartment on the train. These smaller splurges afford you the opportunity to cut entire days of travel from your schedule, and you’ll often arrive feeling more refreshed. For backpackers, if it’s all about maintaining a low travel budget, then be sure to bring sweaters for the buses, neck pillows, and things of that nature that make long travel days a bit easier. I will also note that the Lonely Planet and Travel Fish are the two best sources for updated nitty-gritty details if you are off-the-path and need connection information. Once you’ve arrived in Thailand, there are a ton of sights to see and things you want to do. But getting around may seem intimidating to a first-time traveler. There are a range of transport options for inter-city travel, and it just comes down to your own preferences and comfort-level. Are you willing to ride on the back of a motorbike, or do you prefer private taxis? Both are available in almost every city, and there are options that split the difference, too. Red and yellow songthaews in Chiang Mai, Thailand. In Northern Thailand, the most popular way to get around a city is by songthaew, which is a pick-up truck that has been converted to add a roof over the truck bed, as well as two benches bolted down on each side. You will see these all over Chiang Mai and some run in the Bangkok suburbs. The fare is usually a set 20 THB (60 cents) go anywhere in the city, however it will cost more if you’re venturing into the suburbs, or to another town. In these cases you will need to negotiate with the driver. And note that these are not taxis, but rather run in patterns throughout the city. So you must catch a songthaew heading in the right direction or else they won’t let you even board (and since most don’t speak much English, you might not understand why they say no). The colors indicate local (red) versus long-distance (yellow), and you can navigate within Chiang Mai, and also to nearby towns. Ask your guesthouse before you leave if you’re heading somewhere specific and they can help you stand on the right corner to flag one down—it’s a very economical way to travel around Chiang Mai and I highly recommend you give it a shot. In Bangkok, it’s possible to get around parts of the city by canal taxi (there are many canals in Bangkok). While this mode of transportation is mostly used by locals, it is a fun way to get around. The canal taxi runs from 5:30 am to 8:30 pm and fares cost 8 to 20 THB, depending on where you’re going. The canal taxi route begins near Khao San Road and stretches well past Central World in downtown Bangkok. Bangkok has a metro system called the BTS, and it’s a handy way to navigate the city if it goes to where you’re heading. It’s not nearly as extensive as many big-city metro systems, but it is clean, fast, and completely efficient. You can use it for an airport transfer, but also to jump to another part of the city, where you can then either walk to your destination or use a mototaxi or taxi (I don’t recommend any traveler use the tuk-tuks in Bangkok). There are many major spots on the BTS route, including Chatuchak Weekend Market, the riverside, all the glossy high-rise shopping malls, and the places to see on all Sukhumvit roads. A one-day pass is just 120 baht, or it’s as low as 15 baht for one stop. Taxi cabs certainly run their own scams in Bangkok and other areas of Thailand, but there are trusted and fair ones you can use… but it’s also very likely you’ll get scammed, especially if you hail one in a touristy area. Instead, I always travel with the Uber app installed on my phone and it’s dead-simple to summon a taxi and you clearly know the price ahead of time. There is Uber throughout the region’s big cities, and you can also hail a mototaxi through the app, which is pretty cool. If you use a cab, pick one up from an official stand at the airport, make sure the meter is on, and pay attention to your surroundings. Also, never allow the cabbie to pick up another passenger—if this happens, leave the vehicle immediately as this is often the precursor to getting robbed. If you have a local SIM, Grab is the regional version of Uber and offers slightly better rates but you’ll have to pay cash. A tuk-tuk / songthaew hybrid in Southeast Asia. 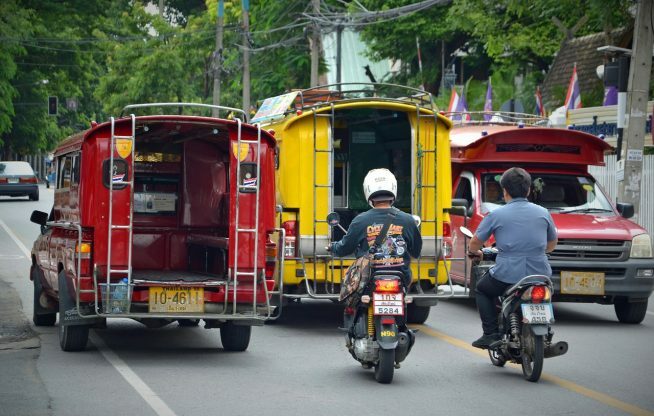 You’ll see tuk-tuks throughout Thailand and while they can be a fun way to get around, use extreme caution. It is quite easy to get scammed by a tuk-tuk driver. Even experienced travelers have fallen for Bangkok’s notorious scams. It’s important to negotiate before getting into a tuk-tuk, and never fall for the 10 THB rides in Bangkok as you’ll be touted to shop after shop and expected to buy things you don’t need. If you really want to have a fun tuk-tuk experience in Bangkok, do a tuk-tuk tour of the city (this one is quite good). 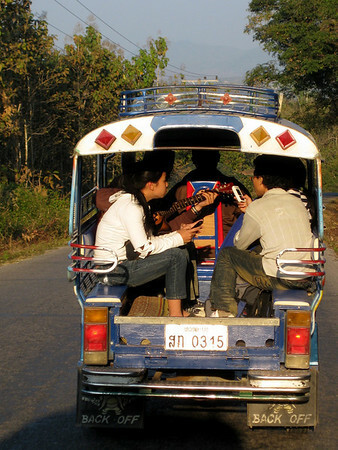 The tuk-tuks in smaller cities have fewer outright scams and are sometimes a safe bet if you negotiate a decent rate. They will charge you more than, say, a moto-taxi or songthaew, but it’s rarely truly exorbitant if you are hiring them for a ride across town (the scams come in when you book them as your tour guide, or use them late at night after you have clearly been drinking/partying). There are two considerations here. Travelers can use moto-taxis to navigate every city in Thailand—these are drivers who hand you a helmet and will ride you across town for a small fee. Since motorcycles are fast and small, you can easily weave through busy traffic and significantly cut down on your transit time going most anywhere. These moto-taxi drivers are generally scam-free (although they will jack up the rate to whatever they think you will pay, so feel free to negotiate before getting on the bike). This is an easy and popular way to get around Bangkok and Chiang Mai and even many southern islands and cities. If you are traveling light (with just a backpack), you can even use moto-taxis for longer transfers to bus stations and such (I have done this countless times in every country in the region). Many drivers have limited English, so know your destination, or have your guesthouse write it down before you leave (and always have the business card of your guesthouse so you can return home at the end of the day!). On the other side, motorcycling Southeast Asia is a dream for some backpackers. Perhaps you plan to rent/buy a motorbike and ride the entire region. Or you simply want to rent a motorbike while in the Thai islands or Chiang Mai so you can explore at your own pace. It’s mega easy to rent (bring your passport to the rental office), and it’s fun, too. But it’s also dangerous, especially if you are inexperienced or unfamiliar with traffic patterns in Southeast Asia. Always have travel insurance if you go this route as accidents and Thai road rash is super common among backpackers. You also must be licensed to drive in your home country, otherwise your insurance won’t cover you if you have an accident (more on that here). 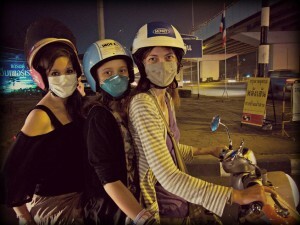 After spending a few days in Bangkok, many backpackers will travel north to Chiang Mai. The train is probably the most popular option as it is often cheaper and allows you to move around during the trip. Long-distance buses and budget airlines are also popular choices. Let’s break down the costs between the three. My niece Ana on the budget overnight train from Chiang Mai to Bangkok—we had sleeper beds and she just loved the train experience. There are a couple train options between Bangkok and Chiang Mai. The cheapest option is train 7 which departs Bangkok at 8:30 am and arrives in Chiang Mai around 7:30 pm. A second class train ticket to Chiang Mai costs about 641 THB ( $19 USD). If you prefer to take a night train (saving you the cost of a hostel bed or hotel room), you can take train 13/14 which departs around 7:30 pm and arrives in CM at 8:40 am. A second class ticket costs 791/881 THB ($24/$27 USD) and a first class ticket costs 1253/1453 THB ($38/$44 USD). If you feel like treating yourself, consider taking train 9/10 which features new Chinese-built sleeper cars that are absolute heaven. An overnight train with wifi and a restaurant, a second class ticket will cost 941/1041 THB ($27/$32 USD) and a first class ticket will cost 1453/1653 THB ($44/$50 USD). One thing to remember with taking the train is that they rarely run on time. It is common for your train to leave later than scheduled, so bring snacks, water, and a book or something to entertain yourself. You may also find delays at stops along the way, so just go with the flow. If you’re backpacking, there is a good chance you can find other backpackers in the cars and start a game of cards or some such to pass the time. If you’re staying on or near Khao San Road, there is a fairly cheap bus service to Chiang Mai which you can book through the tour desk at your hostel or with a travel agent along Khao San Road or Soi Rambuttri. The ‘tourist bus’ is a double-decker bus that runs overnight, and tickets are generally 300–500 THB ($9 – $15 USD — if you’re on the upper end of that, you’re not bargaining effectively). Another option is a ‘VIP’ bus that leaves from the bus terminal. While you can purchase tickets with a travel agent, it is sometimes best to go to the bus terminal and buy the tickets yourself, this way you know you’re getting what you paid for (some have been scammed by travel agents charging ‘VIP’ bus prices when the ticket is for a local bus, which is quite basic and not at all comfortable). To get to the bus terminal, take the BTS to Mo Chit station, then walk or take a taxi (or mototaxi) the rest of the way. A VIP/Deluxe bus ticket to Chiang Mai costs anywhere between 600 THB ($18 USD) and 900 THB ($27 USD) depending on the bus. As the VIP/Deluxe buses have air-conditioning, wifi, comfy chairs and snacks, they fill up quickly so it is best to book your ticket at least three days in advance. The ride between Bangkok and Chiang Mai usually takes 8-10 hrs and includes a rest stop. Flying is he fastest, but not necessarily the cheapest, way to get from Bangkok to Chiang Mai. Thankfully, a few budget airlines run that route. Most fly out of Bangkok’s Don Mueang Airport (DMK), which can be quite busy (currently passengers are encouraged to arrive three hours early due to new security measures). The most popular airlines out of DMK are Air Asia (starting at 830 THB / $25 USD one-way) or Nok Air (starting at 899 THB / $27 USD). Another popular option is Bangkok Airways (starting at 1200 THB / $36 USD) which flies out of Bangkok’s Suvarnabhumi airport (BKK). 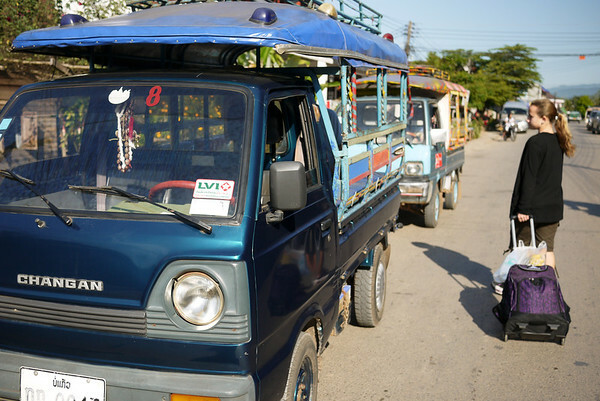 Within the cities, you can take buses, taxi, songthaew (shared public truck-taxis), and tuktuks. Thailand can get quite hot and while the cool mountains in the north can be nice, the Thai beaches are a superb choice with their pale sandy beaches and turquoise colored waters. Similar to traveling to CM, there are buses, trains and budget airlines servicing Southern Thailand and the islands. Here are your options. The train journey south is similar to the north in that trains rarely leave on time. Whether you’re planning to visit a coastal town like Hua Hin (102 THB / $3 USD) or to to islands like Phuket, Krabi or Koh Samui, train 43 is probably your best option. To get to the islands you’ll need to take the train to Surat Thani (248 THB / $7.50 USD), then travel by bus to Phuket (230 THB / $7 USD) or Krabi (279 THB / $8.50 USD). To get to Koh Samui you’ll need to take a taxi or bus and then a ferry which can cost around 400 THB ($12 USD). While taking the train can be cheaper at times, the journey is long and tiring. Not a recommended route unless you are really bootstrapping your travels, or traveling with a large group who can help keep it entertaining. If you’re going to Hua Hin, you can take a van from Ekkamai BTS for about 180 THB / $5.50. If you’re traveling to Koh Samui you’ll need to fly to Surat Thani, then take a ferry transfer to the island. This can be booked as a package through the airline. Air Asia offers this service for about 1540 THB / $47 USD. Nok Air offers a similar package for about 1599 THB / $48 USD. It is important to remember that budget airlines often have extra fees for things like seat selection, checked baggage and so on. It is advisable to read the rules carefully before you book your flight so you are not surprised by extra fees at the airport. A train that leaves from Bangkok’s Hualamphong station and travels to Ayutthaya for about 20 THB (60 cents) in third class. The trip is a couple of hours. If you want a fast train with air conditioning, you’ll pay more. Going by van is the most popular way to get to Ayutthaya or Sukothai. While space is limited, the drive is short and the fare is about 240 THB / $7.25 USD. If you want to go to Sukhothai, you’ll need to take a long-distance bus from the terminal near Mo Chit BTS. Fares to Sukhothai start at 346 THB / $11 USD. If you’re backpacking the region (of if you need to do a border run), then you are likely heading into one of Thailand’s neighbors. Each country has its own requirements for border crossings, and there is no uniform way across all destinations — every single overland border is different, so research ahead of time to make sure it will meet your travel needs. Thailand to Laos: Backpackers generally enter Laos overland from two key border crossings. If you’re leaving from the north (Chiang Mai or Chiang Rai region), then you take a bus to the Chiang Khong to Huay Xai border crossing, then you’ll need to travel down the Mekong River to Luang Prabang (here’s how to do it). If you’re leaving from Bangkok, then you’ll take a bus or train/bus combination to the Friendship Bridge border crossing between Nong Khai and Vientiane (here’s how to do it). There are other border crossings, but these are the most popular for backpackers, by far. Although you could fly, there are no budget flights, at present, into Laos. Thailand to Cambodia: Most Cambodia-bound travelers are heading to Angkor Wat, so you’re looking to go to Siem Reap. There is much potential for scams at this border crossing from Aranyaprathet to Poipet—it’s completely dysfunctional, so do your research ahead of time and know how it should all go down. The Had Lek to Koh Kong crossing is also easy if you’re navigating to the islands and southern Cambodia. It’s a less stressful border than the other, and I’ve used it several times on my way in and out of Cambodia. If you have the budget, AirAsia, Angkor Air, and Ba fly between Siem Reap and Bangkok—tickets are reasonable (in the $50 range) but you may pay a bit for airport transfers and such on either side. Thailand to Myanmar: Flying is one of the most popular ways to enter Myanmar from Thailand because it used to be among the only ways. But tourism has opened in Myanmar and there are now three border crossings that service the north, central, and southern areas, and flights from both Bangkok and Chiang Mai fly into Yangon or Mandalay. Thailand to Malaysia: The Sadao to Changlun crossing is among the most popular overland crossings, but it only makes sense to go overland if you are already in Thailand’s far south (perhaps traveling around the Thai islands) or if you want to do a visa run to Penang. If you’re leaving from anywhere else, AirAsia and other discount airlines offer crazy-cheap flights into Penang and Kuala Lumpur (which is AirAsia’s hub).